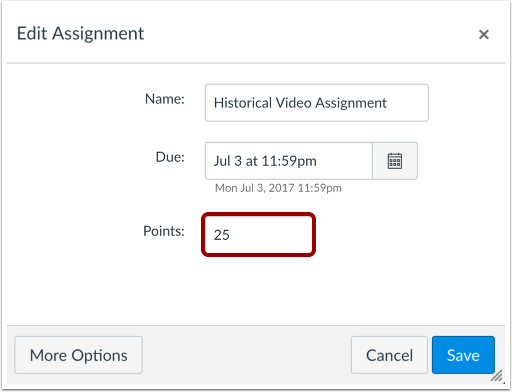 You can add or edit the amount of points on a given assignment. Note: When an assignment is set as a moderated assignment, only the moderator or a Canvas admin can edit the assignment after it is published. 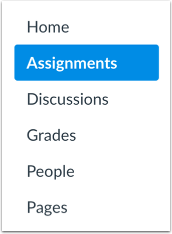 Click the assignment's Options icon  then click the Edit link . Edit the points available for the assignment by typing in the points field. Previous Topic:How do I add or edit details in an assignment? Next Topic:How do I exclude an assignment from the course's final grades? Table of Contents > Assignments > How do I add or edit points for an assignment? I have this same problem. I mistakenly did not specify the point value for the assignment when I created it. Now, when I use the edit feature as described above, there is no point box to edit. When clicking on "More Options", it takes you to the detail page for the assignment, but again there is no point box to edit (on that page, it should be just below the Instrutions/description box and it isn't). At the top of the details page, it shows "Points 0", but I haven't found a way to change it. I already have scores entered - this was an off-line assignment. I could delete and recreate the assignment shell, but I would prefer not to - I would just like to edit the point value to say 10 points instead of zero. If I delete the assignment, I will have to re-enter the grades. I know it's only been a short week since we replied to your comment, but I wanted to reach out and see if you were able to find answers from your school's Canvas admin or from Canvas Support. Please let us know if there's anything else we can help with or if you have any further questions that you think we can help answer. In the meantime, as you know, we periodically remove comments from the Canvas Guides. If your comment thread here disappears in several weeks, you'll know that we've just done some housekeeping in an effort to keep the guides updated. Re: How can I change the points or % assigned to the Assignment tasks on a later date?